Previous blogs have touched upon the ways in which the Imperial government in London tied together geographically and governmentally disparate colonies into a relatively cohesive entity known as the British Empire. We have likewise discussed some of the activities of empire – communications technology, steam transport, conservation and geological surveys – that together, tied in very closely with the notion of the British Empire as a modern, ‘civilizing’ body. This self-image was projected from the centre no more profoundly than in the latter nineteenth century. The consolidation of Britain’s political presence overseas, the confederation of Canada, and the unification of South Africa were driven by a number of factors, including inter-Imperial rivalry, but were likewise fraught with a sense of the Empire’s righteousness, as though it were Britain’s moral imperative to conquer the globe. Today’s blog, however, will touch upon the dissonance between the image of Empire projected from the metropole that drove imperial policy, and the realities of empire that brought those policies to fruition in the colonies. Here, I will explore a two documents that point toward this separation, governmentally and ideologically. The first, from Mauritius, encapsulates the ideological discrepancies between how the practice of empire was conceived from the colonies and from the centre, while the second, from the Cape Colony, indicates a similar distinction within the practice of government and the art of war. As the tone of racism and violence that underpinned imperial expansion for centuries became more pronounced, we see evidence of conflict between the Colonial Office and the colonies as they debate whether the ‘ends justify the means’ and officials in London repeatedly remark that, ‘this is not how things in the British Empire are done.’ Together, these documents portray an ideological dissonance: an Empire torn between its self-imagined moral authority and its violent reality. Mauritius is an interesting case study. People of colour were the majority population, with many of them Indian indentured labourers. Colonial officials in such colonies often expressed anxiety at being outnumbered by people of colour, and Mauritius was no exception. In late-1857, during the height of the Indian Uprising, security was a clear concern. As revealed in an earlier blog, in that case the colonial government sought to control the Indian population through the implementation of a system of compulsory education. By 1879, however, it appears that the government had turned away from regulatory methods of social control and towards force. In 1879, it becomes readily apparent that, at its highest levels, the colonial government of Mauritius is imbued with a deeply embedded distrust of the island’s majority population. The documents under consideration are a letter from the Acting Governor of Mauritius, F. Napier Broome, to the Port Louis Prison Committee, asking their opinion ‘whether the general practice of the more civilised countries, namely the private in lieu of the public execution of the sentence of death, might not with advantage be introduced into the Colony.’ While the subject under consideration is whether capital punishment practices ought to be amended to align with those undertaken in England, to offer a ‘more decent’ mode of execution, the Prison Committee instead offers a report on the various merits of reinstating execution by beheading (rather than the standard practice of hanging that was used in both the colonies and at home at this time). The Procureur General then notes that ‘the Indian is certainly not afraid of death,’ explaining ‘I do not attribute this indifference to any exceptional courage or want of nervous power on the part of the Indian, but rather to the disbelief which he feels in the form of punishment. He is prepared to die, provided that his identity is not destroyed by any form of mutilation.’ This argument is presented to justify his conclusion that the issue of a public or private execution is irrelevant, and his concurrence in the Chief Medical Officer’s assessment that beheading is a punishment ‘more befitting’ the Indian population. It certainly indicates the kind of racism that permeated colonial governance, as well as the forms of violence against non-European populations deemed acceptable by colonial administrations. The opinions presented here by the Procureur General were echoed by the Chief Medical Officer, Head of the Police Department, and a Magistrate. The Minutes of the Colonial Office, presented upon receiving this Report, present a very different opinion. They immediately dismiss the proposal to reinstate beheading as barbaric and merely a long-forgotten relic of French rule in Mauritius, not even taking the idea under serious consideration. 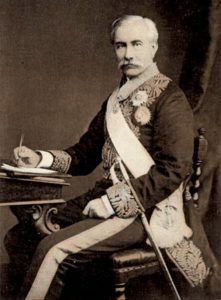 Sir Robert George Wyndham Herbert, Permanent Under Secretary of State, in fact, suggests that all the colonial executions should be conducted on the English system, within the confines of the jail. Sir Michael Hicks Beach, Secretary of State for the Colonies, likewise agreed, expressing what was to him an obvious opinion that, as part of the wider British Empire, all the colonies ought to adhere to the ‘civilised’ example set by the Home Government in England. The case from the Cape Colony may seem not to relate to that from Mauritius just discussed. However, it points to a similar disconnect between the Home and Colonial Governments, both with regard to the prerogatives held by the imperial representative, and to the attitudes regarding non-European communities. In his initial despatch, Governor Sir Bartle Frere, Governor of the Cape Colony, defends his issuing of an ultimatum, and the use of force against the Zulus, without previously receiving approval from the Home Government. The Colonial Office’s reply is revealing, showing that in fact the imperial government in London was not aware of the military initiative until it was already underway. This document not only calls into question any popular assumption that the Anglo-Zulu War was directed and approved from London; it also sheds light on the uncertainty that still prevailed as late as 1879, regarding the power wielded by colonial governments. The questions at the core of this debate are whether the Governor had the power to authorise a significant military intervention without sanction from London, and whether there were any circumstances which made such action immediately necessary. The Governor argues that “it would have been useless to expect to wait the two months for a reply from Her Majesty’s Government, without some fresh manifestation of Zulu impatience or without an outbreak of discontent in the Transvaal or elsewhere.” He then constructs an argument, listing a series of justifications that are systematically dismantled in the reply from the Colonial Office. It is firstly abundantly clear that the Governor absolutely did not have permission from London to engage the colony in war. One of the Undersecretaries of State comments upon the Governor’s despatch, “There does not appear to be anything in it to relieve Sir B. Frere from the crime administered to him on the 19th of March for committing the country to war without the sanction of Her Majesty’s Government.” In this statement it is made evident that not only was the Colonial Office unaware of Sir Bartle Frere’s machinations, but that they disapprove and that his assumption of this prerogative is tantamount to criminal. It is quite clear from what follows that the passage underlined refers to an outbreak of Boer discontent; and the passage will give strength to the allegation made by some that this war has been undertaken to please the Boers – a charge which would go far to discredit the policy of having an annexed Transvaal. Frere then defends the urgency of the conflict, suggesting that the Zulus were on the brink of invasion, placing colonists settled along the banks of the Tugela River at great risk. However, in the course of this argument he also suggests that during the rainy months the Tugela “is in such a state as to make it dangerous for any Zulu force to cross it for raiding purposes between October and March.” This passage was taken by the Colonial Office, however, to prove the opposite of what Frere had intended, that there was no need to begin the military engagement so hurriedly. They suggest that if the Tugela was unpassable until March, then it would have served as a barrier to any kind of Zulu invasion; Frere could therefore have waited until March, which would have offered more than enough time for communication with the Home Government. Moreover, the Colonial Office rebuts Frere’s claim that Cetshwayo and the Zulus were determined to invade Natal this year, pointing to the ultimatum issued against Cetshwayo as evidence. The Colonial Office determines that if such was the case, then the invasion of Zulu country would have been a “justifiable act of self-preservation” and there would have been no just reason to send an ultimatum. This can be related back to previous correspondence concerning the ultimatum, which held it and a preceding land award as directly responsible for the ensuing conflict. In reference to the land award, which gave “the Zulus nominal sovereignty of the country” and gave “the country itself to 80 or 90 Boers,” Edward Fairfield, a member of staff at the Colonial Office, likened it to “giving the shells to the Zulus and the oysters to the Boers.” Fairfield further proposes that by following the Award with the ultimatum – which required the disbandment of the Zulu army and fundamental changes to the Zulu marriage system – it ensured that the war was virtually inevitable. Such comments elicit the impression that the Colonial Office did not believe the war to be the inevitable result of Zulu aggression, as indicated by Frere, and rather the deliberate consequence of colonial provocation. These two cases provide a glimpse into the culture of imperial governance in 1879, shedding light on the difficulties faced by the Colonial Office in maintaining an ideologically and governmentally cohesive empire. The debate surrounding the Zulu ultimatum calls into question the fluidity of communications between the Cape and London. It suggests that the delay effected by use of the steam postal service was, if not a barrier to communication itself, at least a useful excuse for exercising executive power from the colony without the need of approval from London. It likewise sheds new light on the sense of urgency expressed by the Colonial Office regarding the construction on the Great Sea Telegraph, casting it into the context of a dispute regarding the extent of the Governor’s authority in the Cape Colony. Meanwhile, the case presented by the Mauritius petition sheds light on the administrative culture in the colony. It likewise develops farther-reaching relevance as opinions such as those presented by the Prison Committee impacted upon the Major General’s willingness to send troops to reinforce those fighting the Zulus in the Cape Colony and Natal. Despite the overall peaceful state of the colony, he refers to the ‘criminal tendencies of the lower classes of the population’ and that ‘many…are committing murders and robberies in all directions.’ In such conditions, troops could not be spared for the imperial enterprise as a whole. Such opinions had a clear and decided impact on the Colonial Office’s ability to mobilise its empire. In contrast to the example posed by the Indian Uprising in 1857, colonies such as Mauritius that had previously willingly supplied troops to other colonies as required, were hesitant to do so in 1879. Had a culture shift occurred, resulting in some colonies’ turn away from the Home Government and the British Empire as a whole, and toward preserving their own administrative autonomy and security? National Archives, Kew. Mauritius Despatches 1 Jan-31 Mar 1879, No. 170, F. Napier Broome to Sir Michael Hicks Beach, (31 March, 1879). National Archives. Mauritius Despatches 1 Jan-31 Mar 1879, Prison Committee, “Minute of the Public Execution of Criminals,” (March 1879). National Archives. Cape Despatches 1 Jan – 30 April 1879, No. 3217, “Confidential,” (26 Jan, 1879). National Archives. Mauritius Despatches 1 Jan-31 Mar 1879, No. 129, F. Napier Broome to Sir Michael Hicks Beach, (9 March, 1879).